Photographer and artist Barry Rosenthal is inspired by nature. His latest series, Found in Nature, is a response to what he was seeing and feeling while out on beaches. 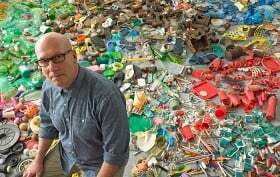 Barry, whose pieces can be found in the permanent collection of the MoMA in New York City and the Springfield Museum of Fine Art in Springfield, Massachusetts, is himself being found through Found in Nature. The series was recently featured in Brazil’s National Geographic Magazine. Although Barry works in nature, he has lived in the caverns of the Financial District since 1987. Long before the neighborhood would become popular with young professionals and families, Barry and his wife, Elyn, found that the area — then made up primarily of office buildings — had just what they were looking for: space. Over the last 25 years, they and their daughter Macie, now 18, made the Financial District their home. The family was certainly ahead of the curve. As a New Yorker, I was curious to learn more about Barry. What was it like living in this neighborhood back in the ’80s, especially from the perspective of a photographer and artist with a keen eye for observing the world? Why did he decide to head out of his studio and work in nature?